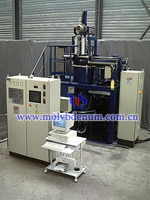 Hot isostatic pressing is one of molybdenum forming methods. High temperature hot isostatic includes pressing and sintering process, due to the inert gas or molten metal pressure to establish medium effect used for high density and large product refractory metal production. The preparation processes are generally as follows, to put the powder compact into high-pressure container of hot isostatic pressing, while subject to high temperature and all round high pressure effect, to strength pressing and sintering, to reduce sintering temperature, so the grain structure of the product is improved and the defects and porosities between the particles are eliminated, which great improve the density and strength of the material. Its principle is basically the same with the hot-pressing method, but the density is higher and grain is finer, having better performance. HIP has become a modern powder metallurgy technology in large complex switch products and high-performance materials, an advanced technology. 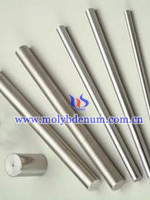 Product produced by hot isostatic has high density than hot-pressing method produced, especially for molybdenum metal production.